When I first landed in Zambezi, my hands disappeared into a sea of ebony. They were poked, rubbed, squeezed, and shaken. 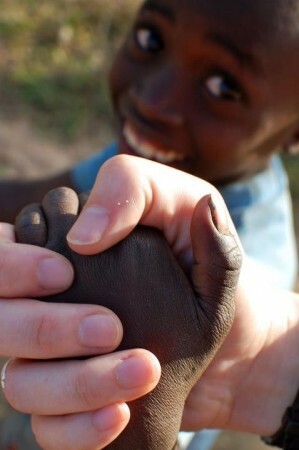 My hands touched Zambia before my feet could even reach the ground. Small, soft, dirty hands gently grasped my sweaty, nervous hands. Additional hands reached in, trying to claim at least a finger of their own. Warmth ran up my arms, down my spine, and filled my heart. As I walked toward the crowd of our wonderful greeting crew, various hands welcomed me to my new home for the next few weeks. This first experience has made me realize the importance of human contact and connection. Our distal ends bear the brunt of our interactions with the world. They are the first physical contact with humans, objects, and the world around us. They provide a sensory experience that influences our thoughts, feelings, and actions. During my short time in Zambezi thus far, I have come to understand how intertwined humans really are. Last night, members of Our Lady of Fatima Catholic Church graciously opened up their homes to our group. Peter, Nick, and I traveled to Mushuna outside of Zambezi. Us “chindeles” (outsiders) were welcomed and celebrated by the entire community through handshakes, claps, dancing and many hugs. Violet and Steven, our hosts, along with their five children and about forty neighboring children showed us one of our first true cultural experiences. This village, with no electricity or running water, bases their community on using their resources and working together. They grow most of their food, build their houses out of mud bricks, and most families share one room for sleeping. During our night’s stay, we learned about food, etiquette and traditions of Zambians. Vast differences in culture and lifestyle unfolded; however, many similarities stood out to me. The parents were extremely hard working and wanted the best for their children. Additionally, I bonded with the twenty-year old daughter over music, dancing, and goals for the future. Peter, Nick, and I departed this morning with hugs around our legs and waist from the many happy children and hand shakes from Violet, Steven, and other adults of the community. In general, I am not a touchy person. I value my personal space and find I share love in other ways. However, since my arrival in Zambezi, I have grown to not only normalize human contact, but to actually enjoy it. Human contact has shattered the walls between strangers and friends. Each person I have met has treated me as a friend and welcomed me with open arms. Additionally, human contact has broken language and cultural barriers. It has enhanced broken conversations with those who speak little to no English and has helped me make my point when I pronounce my Lunda or Luvale greetings wrong. To me, hands have come to symbolize togetherness: shaking the hands of elderly Zambians, clapping in unison to the beautiful singing of the church choir, walking hand-in-hand with children, and receiving countless waves as I walk by. Hands have broken barriers and have reminded me that no matter our cultural differences, we are very similar in our interconnectedness as human beings. P.S. Hello to all of my family and friends back at home! I am missing and thinking of you! I can’t wait to share my experiences with you all. Thank you for sharing your reflections with us. Gosh, it’s wonderful that you are already feeling this interconnectedness within your first few days. Isn’t that hand holding something else?! I remember quickly understanding how important the nonverbals become when you only share a vocabulary of 50 words; sometimes you just have to grab a hand and hope for the best! WOOHOO! HOMESTAYS! I forgot how soon they come. I cannot wait to hear more about these!!! Was there dancing, tell me there was dancing! That is so great that you were able to connect with the daughter and on several different levels. Soak up all she has to share with you, those relationships are truly what this is all about. Now I believe you all will be reading these comments on either your first or second day of classes so of course I want to wish you all good luck. You are all prepared, you are all smart, and you are all qualified. ROLL ZAGS. Lindsey- Loved your reflection on the differences from your Kenya trip to this one, that is pretty awesome to be able to have something to draw comparisons from. And I hear you on that welcome, the people of Zambezi have a lot to teach us on hospitality. Lauren- Junior will most likely need a little reminder to go to school, he can kind of be a punk, but we love punks so that’s fun. JEFF- I miss you, your sass, and your socks. How was all the flying? What have you been making for dinner? Yep that’s right, I am a thousands of miles away and still trying to get into your kitchen. Han Van- Hope your body is being nice to you. This group is so lucky to have you, you are exactly where you are meant to be. PSHERM- Hope that big smile is shining as bright as ever. So proud of you, love. Joshua- Wow, is this trip 10??? STUD. I bet it feels great and the books are in?! Holy smokes you did this, of course with help, but you did this. Thank you for your foresight and perseverance! Reils- I hope it feels better than anticipated. Couldn’t be more proud/excited for you and all that is to come! The last week wasn’t the same without you around, we are getting ready to head out and move on. We keep quoting Fr. G saying “this is not the place we go to, rather come from”, maybe you will find themes of this in Zambezi as well. See you soon. There is nothing like the sweet touch of a trusting hand placed in yours. Enjoy! Kenzie, sending you lots of love right now and a huge grandpa hug haha. Let the touch of your hands be felt with the heart. Let go of fear and be vulnerable. It’s like walking into a family that already loved you before they met you. Continue to press those boundaries of comfort, towards the place where fullness and love await. It’s ironic how right now my fingers have touched my IPhone screen more than a real person. Oh, how easy it is to forget the real connectedness you learn in Zambezi. To the leadership team: good luck on your lessons, speak slowly. I remember a student kept saying “are we together?” Rather than “are you with me?” That never leaves my mind. Continue to challenge values and inspire change. Know that you all, health/teachers/computer groups included, are giving them the currency of knowledge that can’t be stolen–this affirmation coming from a Julius, a 30-yr oldish student, after asking him why he valued the leadership course. To the blogger before Kenzie, continue to disable those barriers and find a place where your own practice of accompaniment is perfect to you and the immediate person you’re accompanying. Or perhaps the goals isn’t perfection. I’m constantly hitting refresh here in Hawaii, wishing you all the best. You are all so loved, even by irrelevant alumnae such as myself haha. P.s. Josh- I talked to teo recently. We’ve been both, as said by him, “transported to Zambezi many times”. Also, You in need of two extra pairs of hands next year? Seriously. We don’t joke in Hawaii. This is a lovely piece Kenzie! I am SO THRILLED that you got to stay with Steven and Violet! That experience was definitely a major highlight of my time in Zambezi and I can’t wait to talk to you more about it when you get back. It wasn’t until meeting Steven, Violet, and their community where I really began to understand the love and togetherness that Zambian culture brings. I want you all to know that I’m working a very boring desk job this summer and every morning as I’m pulling up my admin page I also secretly open up your blog in a different browser so I can read that blog posts when I have down time. I never really understood how important this blog was when I was in Zambia last year, but the amount of joy it brings to hear stories of Zambezi is incredible. Keep up the good work everyone! Kenz, you’re words are beautiful. What an amazing experience you’re having! In so proud of what you’re doing in Africa. I’m imagining you sitting in a circle of Zambian children under a tree asking the same life questions that you’ve asked me and our house. Keep asking those questions because those are the moments when authenticity has a change to shine and truth can be revealed. Soak it all up! I’m so happy to hear that you are doing well! Love you so much Kenz! I’ve been thinking of you and praying for you all nearly every day (I’m still a human remember, I forget sometimes). I was hanging out in Church Sunday morning a few weekends ago, Mother’s Day to be exact and something was said that really resonated with me about talks we previously had about your trip to Zambia. (Given it was Mother’s Day so it focused on women, but I think this applies to all of us). Often we feel pressure to make a huge life changing impact and change the world, when what truly makes the difference are the small things such as making interpersonal connections with others. The way you are able to see the value in caring for one person at a time is something I really admire about you. Wherever you’re at, I just wanted you know how incredibly proud I am to be your friend, and that watching you go through this process from being accepted into the program, to having these experiences is really a blessing to witness. I hope you know how much of a rockstar you are and the kind of difference you are making in the lives of these people, whether it is through health education or a simple act of affection. Keep following what makes you happy and know that I support you every step of the way. I can’t wait to hear about all of your new friends and adventures! !